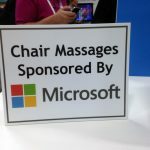 Our most popular trade show sponsorship, the Massage Relaxation Station with backlit bamboo and wood framed shoji screens offers conventioneers a moment of Zen to re-center and recharge in a serene island of calm. Black and white decor with lavender accents, the Relaxation Station includes massage chairs, reclining loungers for foot massage and comfy chairs for those waiting in line. 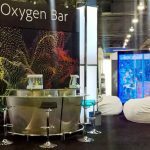 The setup is flexible to fit small, large or irregular areas of the tradeshow floor, or in a hospitality suite. Choose chair massage, foot massage or both!